On their website, the folks at Unity Books in Wellington recap events they hold in-store with blog posts titled AFTERGLOW. So, stealing from Unity (this is, I promise, the only manner in which I steal from Unity), I’d like to look back at the gleaming afterglow of events I took part in while I was in Perth as FAWWA Writer-in-Residence, as well as two ‘in conversation’ events in Wellington that bookended my trip to Perth. Huge thanks to all who came along, and to everyone who made these events possible, including the team at Fremantle Press, and of course to FAWWA and Copyright Agency Cultural Fund for the residency that got me to Perth and let me take part in such a range of events there. The Shadow Land – like Elizabeth’s first two novels, The Historian and The Swan Thieves – reveals its story through a cast of different voices, through the telling of stories long left untold, through hidden or lost and rediscovered documents and artefacts, through travel and through time, in intimate and intricate detail. … The Shadow Land is well and truly grounded in modern-day Bulgaria, and this novel’s horrors are the earthly, all-too-human horrors of recent history, in particular the forced labour camps of Bulgaria’s post-WWII communist regime. But like Elizabeth’s first two novels, in essence The Shadow Land can be called a literary thriller – it’s a marvellous quest, a road trip, a puzzle of fairytales and hidden clues, lost music and lost dogs, relics and riddles and artefacts and identities to be untangled and reordered and restored, a search for resolution, and rest. Take a look at the Unity Books AFTERGLOW recap of the event. It seemed so fitting that my first in conversation event in Australia for The Hope Fault was with Geraldine Blake at Beaufort Street Books, as Geraldine launched my first novel, The Life and Loves of Lena Gaunt, with an in convo at BSB back in September 2013. Geraldine was as warmly enthusiastic and well-read as ever, digging up all sorts of snippets from I-don’t-know-where to question me on. A few days later I drove south to Busselton — round about where The Hope Fault is (mostly) set — at the invitation of local books powerhouse Beth Herbert, for an in conversation at her bookshop, Dymocks Busselton. It was a pleasure to talk about The Hope Fault with writer and bookseller Aksel Dadswell, to meet and talk with readers, and to get a bit of a feel for the book scene in the region. 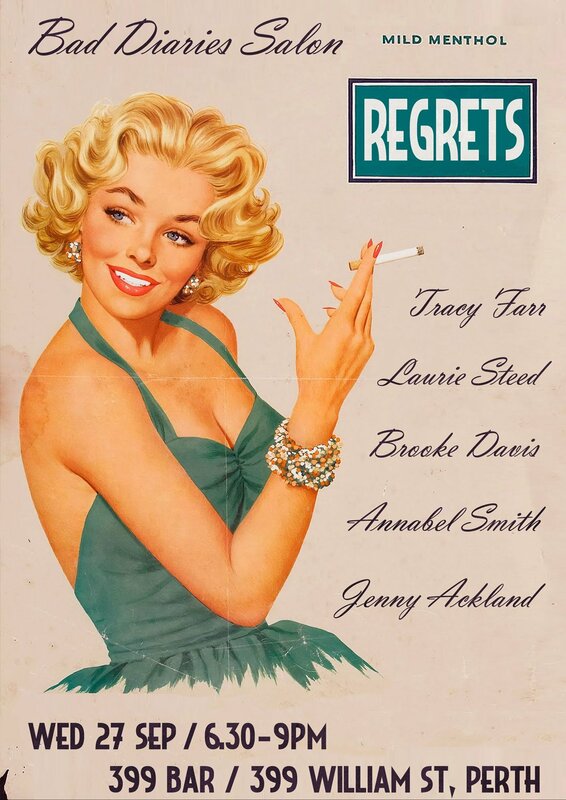 How distracting (reading through all those old diaries…) and wonderful it was to take part in (and help organise) Perth’s first Bad Diaries Salon, on the theme of REGRETS, and what a thrill that BDS co-founder and curator Jenny Ackland flew over from Melbourne for the event. I shared the line-up with three wonderful women writers (Jenny, Annabel Smith and Brooke Davis) I already knew and loved, and with the equally wonderful Laurie Steed, who I finally got to meet. We were joined by a great audience who laughed and groaned and saddened in all the right places, and the event was hosted by the cool and welcoming folks at 399 Bar. Here’s Jenny’s write-up of the evening, including the history of the project. Give The Bad Diaries Salon a follow on Facebook to catch upcoming events — certainly in the BDS hometown of Melbourne, but with other places under discussion. Another in conversation event I was thrilled to do was with Emily Paull, at The Grove Library. I met Emily after my first book came out, and we’ve been saying we’d try to tee up an event ever since, so I was thrilled that Emily was able to work with the team at The Grove Library to organise this event. And it was lovely for it to be on the site of my old childhood library (though the little mid-century block I used to visit in the 60s and 70s has been replaced by a beautiful big new library building on the same site). As well as talking about The Hope Fault, we discussed my first novel, The Life and Loves of Lena Gaunt, which is set in Cottesloe, just down the road from the library. Huge thanks to Emily, to WestBooks, and to Lance and the team at The Grove Library. I had a wonderful event to come home to: talking with Perth-based New Zealand writer Stephen Daisley in an in conversation event for New Zealand Society of Authors Wellington Branch (who’ve just joined Twitter @NZSAuthorsWgtn — give them a follow). Stephen’s second novel, Coming Rain, was one of my top reads of 2016, with his first novel, Traitor, destined to be so for 2017, so it was a thrill to sit down and chat with him about both books, and about his writing life. And something I’m greatly looking forward to: LitCrawl Wellington is back, with an extended programme running from 10 to 12 November 2017, and I’ll be taking to the BATS stage with Jesse Mulligan and Elizabeth Heritage for Short Story Book Club Live! Details over here.